The Evolution AG Series Add-On Wireless Weather Sensor works exclusively with the Evolution AG Series controllers to manage water usage by using live temperature and solar measurements as well as historical weather data for a particular location to calculate the right amount of water needed from the irrigation system. The sensor then transmits the information wirelessly to the integrated Smart Connect® Receiver (sold separately), installed in the Evolution AG controller, then automatically updates the controller for hassle free water savings. Controller and the Add-On sensors communicate wirelessly through radio frequencies up to 1000' away (in direct line of sight). 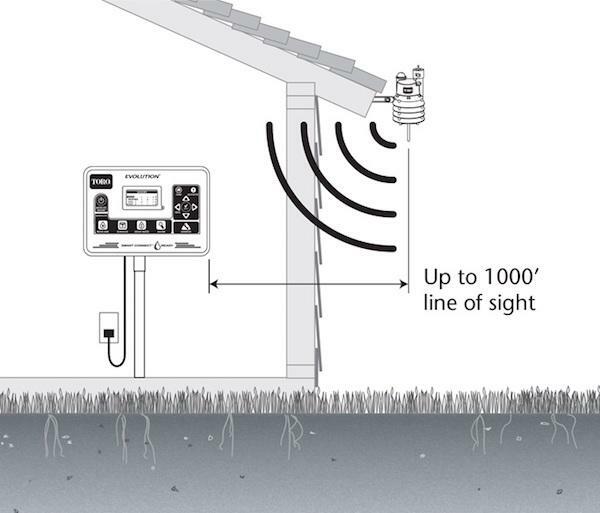 The weather sensor must be installed exposed to the elements of rain and sun.